The building was originally built as Seattle’s Fourth Church of Christ, Scientist. Construction began in 1916. It was designed by Portland architect George Foote Dunham (1876-1949). Built in the Roman Revival style, he wanted it to resemble, in updated terms, Rome’s Pantheon. The church owned the building from 1916 until 1998, when the congregation sold it to Town Hall LLC. The Christian Science Movement was founded in Boston in 1879 by Mary Baker Eddy (1821-1910) who taught spiritual and physical healing through devotion to Christian principles. The First Church of Christ, Scientist, was built in Boston, Massachusetts and opened in 1894. Christian Science became the fastest growing religion in the United States, reaching nearly 270,000 members at its peak in 1936. The Manual of the Mother Church prohibits the church from publishing membership figures. However, it does provide names of Christian Science practitioners (members trained to offer Christian Science prayer on behalf of others). In 1941 there were 11,200 practitioners in the United States. In 2015, there were 965. Seattle’s fourth Christian Science group formed in Seattle in 1909 with 41 members, meeting in rented spaces at Seattle’s Arcade Hall and the Hippodrome Theatre before Dunham began design and construction. Their new building was erected in two phases, first from 1916 through 1917 and later between 1922 and 1923. The main auditorium, named “Great Hall,” had curved pews that could seat 825 people. We will still have those pews in our newly renovated building. 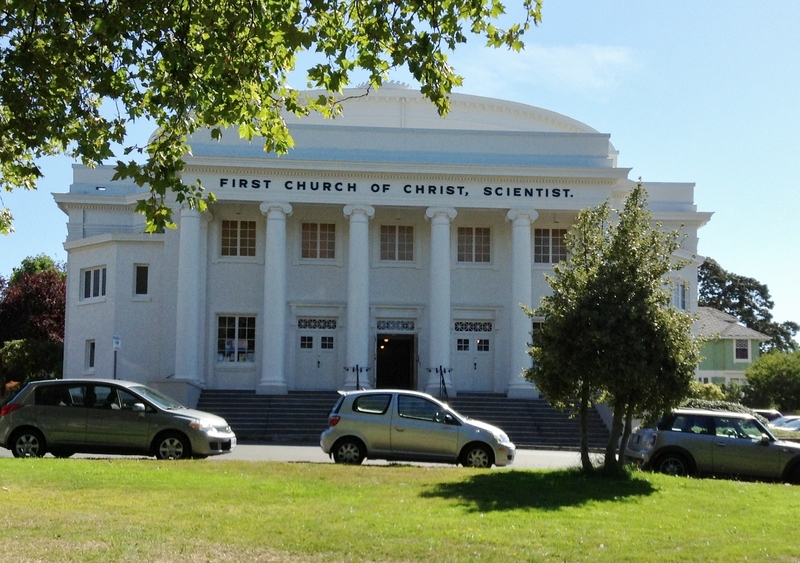 During its service as a church, the Great Hall housed weekly readings of the Bible and Eddy’s Science and Health With Keys to the Scriptures, as well as musical performances. The church installed a theatre organ in 1923. Because acoustics were important to churchgoers, Dunham carefully calibrated the sound projection within the Great Hall. Its shallow dome and thick walls provided good sound. (Town Hall’s new acoustic reflector will offer great sound, by the way. Also, we’ve permanently installed a Hearing Loop system in all our performance spaces.) There are no religious symbols adorning the church, nor most any Christian Science church. Dunham himself was born September 17, 1876 in Burlington, Iowa. He attended the Armour Institute of Technology in Chicago, graduating in 1900, and was soon employed as a draftsman with the late Solon Spencer Beman, who designed Milwaukee’s first skyscraper, the Pabst Building. Dunham worked at Beman’s architectural firm from 1900-1906 until moving to Portland, Oregon where he stayed for 23 years, starting his own firm in 1910. He joined the Portland Architectural Club in 1913 and was treasurer of the American Institute of Architects, Oregon Chapter in 1925. Most known for his residential work in Portland, Dunham also designed several other Christian Science Churches. He built First Church of Christ, Scientist in Portland with Beman; First Church of Christ, Scientist in Victoria, British Columbia; Spokane’s Second Church of Christ, Scientist; as well as other edifices in St. Louis and Orlando, Florida where he relocated to in 1929 until his death in 1949. Do you want to help build upon this history? Give a new gift of $500 or more to have your name inscribed on a custom-crafted plaque on the Great Hall stage—a reminder every time we come together that Town Hall truly belongs to all of us. Learn more, here.